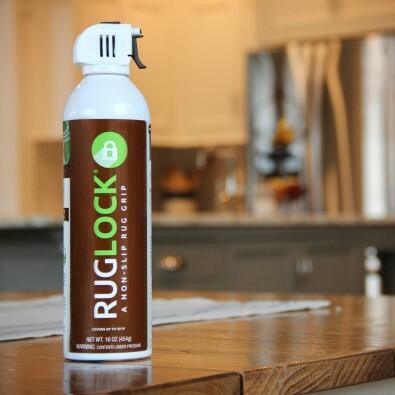 RugLock is the only premium permanent solution to stop your rugs from slipping! This non-toxic, easy-to-use spray creates a non-slip rug grip that bonds to the back of your rug, providing a tack which holds rugs firmly in place on any flooring, without any damage. 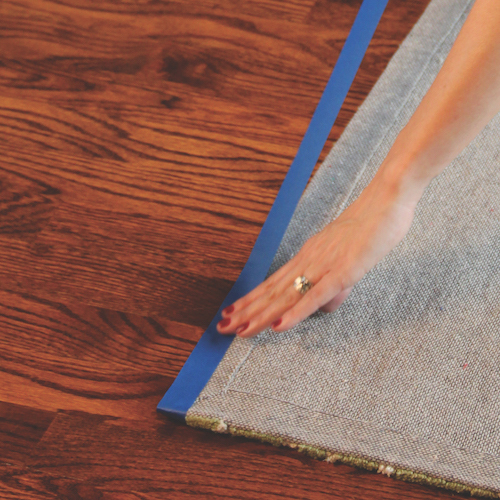 RugLock is a spray-on application that does what rug pads, tape and traditional adhesives cannot do, by creating a permanent non-slip rug backing that grips to all floors in your home without damaging surfaces. With no harmful chemicals (0.0 g/mL VOCs), it can be sprayed indoors safely, even around your little ones and pets! Applied rugs can be easily peeled up to reposition or clean. RugLock is great for additional uses as well. Try it on stair runners, placemats, chair cushions, tablecloths, pet beds, car mats, shoe insoles and more. RugLock will hold rugs to any floor inside your home, but it is not approved for outdoor use. Also, as a water-based formula, it is susceptible to freezing. To make sure RugLock is ready for your next creative idea, your can should be stored inside your home in a temperature-controlled environment, such as under your kitchen sink or in your pantry. And if any residue is left behind after peeling up your rug, simply clean up with a damp cloth or by hand. I just used RugLock this morning on a large area rug in our great room. This was easy to do, and is working well already! I will be using it on all of our other rugs, and we have several since we only have hardwood floors. The instructions were clear, and the operation went off without a hitch. Thanks for an innovative product that was really needed in our house! I don’t usually comment on products/purchases I make, but I felt compelled after using RugLock. I tried other non-slip products … stick-on rug grippers, rubber backing/padding … but they didn’t work and were a waste of money. I researched and found RugLock, and I’m so glad I did. This product is easy to use, and my rugs don’t move, unless I want them to. Used on various material of rugs and have had the same results … non-slip rugs! I would highly recommend this product to everyone. Thank you! 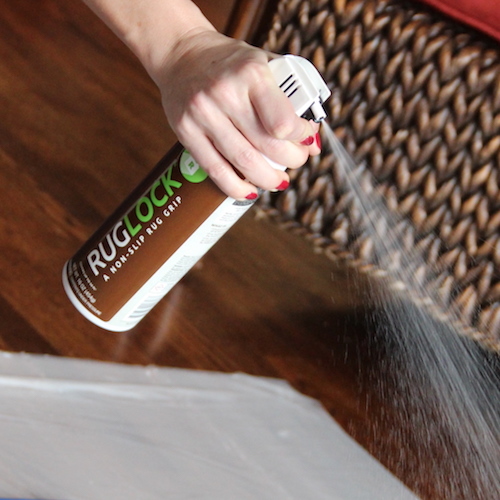 I’d definitely recommend RugLock – I used it for the first time this weekend on a large rug on my outdoor covered concrete patio. We live on the edge of a pretty large hill and get high wind, so that rug has been blowing up almost daily before spraying it with RugLock. It’s now been down solid for 2 days even with some wind that would have typically blown it off. I knew the product would be cool, but it really exceeded my expectations. I used it on a small rug and admittedly I didn’t wait the full time for it dry as recommended by the instructions, but it still worked really well. I’ve pulled it up a handful of times (mostly to show people) and it still sticks to our hardwood floor. Before RugLock the dog would move the entrance rug all around barking at the mail lady, and now it stays in place. I was concerned it would leave a residue of the floor (mostly because I couldn’t wait the 12 hours to put it down), but the residue on the floor wipes right up, even with just my hand. I’ll be buying a few cans for Christmas gifts this year! It’s a product most people might not buy, but then once they use it, they realize they need it. I am super impressed. Ordered Rug Lock for a rug to be placed on our boat. It arrived very quick. Directions are easy. Spray came out even although my rug was a large runner so had to stop a few times in which case clogged the nozzle but easily wiped off with damp rag. Took about 15 min from prep to finish. Let dry 12 hours and it is GREAT!! Does not move. Highly recommend this product. perfect on my hallway rugs. staying down when being vacuum cleaned. We at RugLock are excited for you to try our product and hope our 90 day satisfaction guarantee takes just a little worry out of your day. If you have any issues or concerns with our product please contact our customer support team. If we are unable to help or you are not completely satisfied with your order, return it to us within 90 days of purchase in the original packaging, and we will credit the cost of our product.